Along our journey around Bhutan, we have visited a number of places which offers great views of the surrounding scenery, yet without the hustle and bustle of typical tourist spots around the world – making such places perfect to meditate or even practice yoga. Travelling with a yoga teacher (Boon Cheng) on this tour around Bhutan and armed with our yoga mats, we were always on the lookout for ideal places to have a quick yoga session in the mornings and evenings (before and after our day trips to different Bhutanese cities and towns). Yoga always begins with breathing and meditation before moving onto the actual performance of yoga exercises. This will enable an individual to reach the required meditative state and mindset to gain a deeper level of meditation experience. This is where the importance of a great environment to practise yoga comes in. This environment must facilitate for this spiritual and meditative experience and where better to do so with fresh air high up in the mountains, quietness (away from traffic – both vehicles and people) and an additional bonus – inspiring views of the surroundings e.g. river, hills, forests. All of the above can be found in many places around Bhutan. We will be recommending 4 places in Bhutan to practise yoga which fits perfectly within the above criteria. The most convenient place to practise yoga had to be at our hotel, especially if we are doing morning sessions to start the day with a refreshing session of yoga. Not all hotels will fit within our self-defined criteria for a good yoga place – hotel rooms are too cramped and clutter and there are of course lots of traffic from other hotel guests and staff. However, we found one in Punakha, Bhutan that perfectly fits the bill. Meri Puseunsum Hotel at Punakha is a small hotel with excellent views of the surroundings. We had our own private balcony which overlooks a quiet little village and the mountains. We have wrote about the very luxurious Uma Paro hotel at Paro, Bhutan. 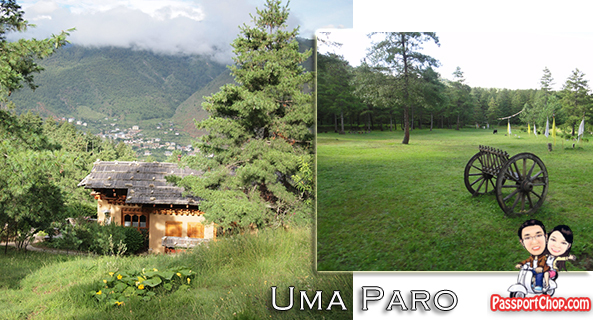 Uma Paro also offers daily yoga sessions conducted by its in-house instructors for hotel guests but if you just need to practise yoga on your own, there are lots of open grass patches where you lay down your yoga mat and meditate without interruptions and at the same time enjoy great views of the Paro valley. You can do this without breaking the bank (spending USD1000+) for a villa as all hotel guests are free to roam around the hotel complex and spend some quiet time on the grass patches. I would advise you to do this only in the early morning as Uma Paro arranges quite a few activities from 10am onwards for its hotel guests around the area e.g. archery, darting and other Bhutanese traditional games – so if you don’t want to be a target, come early. 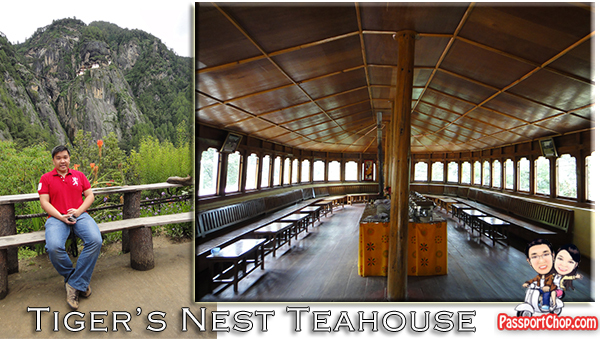 Located at the end of Stage 1 climb towards Taktshang Goemba (Tiger’s Nest Monastery), Taktshang Cafeteria offers a great view of the magnificent Tiger’s Nest. There are 3 stages to the climb towards Tiger’s Nest and Taktshang Cafeteria is the rest stop before tourists and pilgrims embark on their next 2 climbing stages. This cafeteria is especially busy in the late mornings and early afternoon where groups will stop here for a quick breather and some biscuits and tea before their next climb and lunch for groups coming back after reaching the Tiger’s Nest Monastery. At all other times, this cafeteria is very quiet – perfect for a yoga session to relax and meditate after a steep climb up toward the Tiger’s Nest monastery. 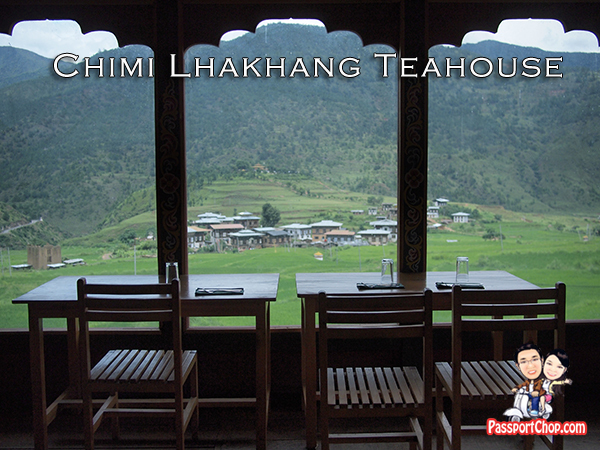 The Chimi Lhakhang Teahouse is a rest stop for travellers going to and fro Chimi Lhakhang temple. From this teahouse, you will be able to get a glimpse of the road ahead leading towards the temple. It will be a perfect place to rest and meditate and recover especially after the long walk to and fro the temple. Excellent post with such beautiful photos! My girlfriend and I would love to visit one day! She’ll do the yoga – I’ll take the photos! Looks amazing. Would LOVE to do yoga here. what a view! i’d love to go there,it’s unspoiled but i heard its expensive to travel to that country. The places in the hotel to do Yoga are all beautiful. I especially like the balcony since it looks to have privacy as well as provide better view of the meadow. The place looks so relaxing and it is perfect to practice some Yoga. What a perfect looking place. The weather looks amazing too. This is one of the destinations I will definitely put in my plans. First off I want to say terrific blog! I had a quick question that I’d like to ask if you do not mind. I was curious to find out how you center yourself and clear your thoughts before writing. I’ve had trouble clearing my mind in getting my thoughts out. I truly do enjoy writing but it just seems like the first 10 to 15 minutes are lost simply just trying to figure out how to begin. Any ideas or tips? Many thanks! Wow It’s really such a nice post ..
Great article. We’re a family run business in Bhutan and we’re working on some new yoga programs. Would love to hear from you and we could organise some wonderful holistic wellness and spiritual program.